Katy Perry Actually Said WHAT About Meghan Markle's Wedding Dress?!? by Hilton Hater at May 21, 2018 2:47 pm . Now that Katy Perry is done feuding with Taylor Swift, the singer has apparently chosen a new target for her wrath. Following Saturday’s royal wedding, the rare event met with universal approval across the Internet, Perry was asked for her reaction to Markle's wedding down. 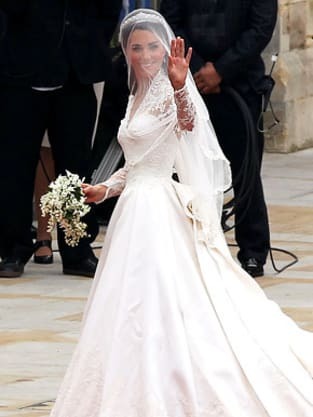 It was a pretty basic ensemble, designed by Givenchy and worn perfectly by the glowing bride. “I’m never not going to tell the truth! One more fitting, but I love you!" 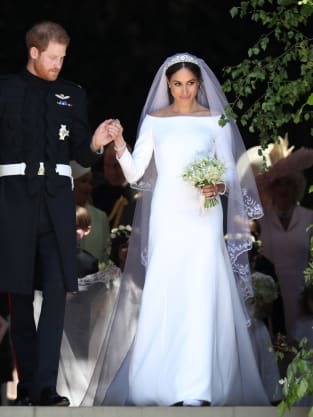 Designed by Great Britain’s own Clare Waight Keller, Markle's dress featured a sleek silhouette featured and an open bateau neckline, along with slim three-quarter sleeves. Moreover, it expertly emphasized the bride's slender sculpted waist, according to Kensington Palace’s official release. Has the gown received the sort of praise bestowed upon Kate Middleton's wedding dress in 2011? Which actually led H&M to come out with a much cheaper version that it now sells in storeS? No. Not yet at least. But why be so harsh, Katy Perry?!? "Kate won! Kate won!" Perry added even more obnoxiously, making clear in this same interview that she preferred Middleton's Alexander McQueen-designed frock. Markle and Harry got married on Saturday, May 19, of course. The ceremony was attended by several hundred guests, while thousands of people lined the London streets to cheer on the couple and millions more watched at home on television. He also praised his bride's "grace and dignity," both of which truly have been on display while she gets dragged left and right by her terrible family members. In her speech, meanwhile, Markle reportedly thanked her mom ("You have always been there for me through everything...") and the Royal Family for accepting her into their lives with open arms. Markle and Harry remain in Great Britain right now, putting off their honeymoon for an undetermined period of time. It's unclear just when they'll depart and it's equally unclear just where they are actually going for this big trip. What is VERY clear, however, is that these two deserve a very long vacation. They've been in the public eye for a long time now and they don't need to just sit back and take this sort of criticism from someone like Katy Perry. We hope they get the chance to get far away from it all soon, to kick back, relax and makes all sort of sweet and passionate love.